REVIEW: 'Faith and the Future Force' #3 by Jody Houser, Diego Bernard, Ulises Arreola, et al. The race to save time continues as Faith and Neela recruit more and more heroes of the Valiant Universe to take on an unstoppable enemy. How many times must time repeat itself before the secure victory? This 'Edge of Tomorrow'/'Groundhog Day'-type of story could grow tiresome, reliving the same day over and over again. However, Jody Houser raises the challenge, inviting more heroes to join the fight against this invincible robot that gobbles up time and anything in its path. Neela's efforts to involve Faith and solicit her leadership hasn't improved the outcome and she reaches a breaking point. It's cool to see heroes from all over the Valiant Universe like Rai, Ninjak, Bloodshot, Quantum and Woody, and others team up. There's not enough time to give each enough dialogue but what it does is heighten the urgency and threat level facing all of them. As many times as they try, Do-Bot and his robot army keep vanquishing the fiercest hero. On top of it all, Neela has kept Faith in the dark about her fate in this endeavor. Faith approaches this challenge from a certain viewpoint but without knowing what happens to her the plan, the failed plan repeats. It's time for Neela to come clean to Faith. The art team of Diego Bernard, Juan Castro, Cary Nord, Brian Thies, and Ulises Arreola deliver a knockout issue. You can see why it would take such a great collaborative effort with so many characters and situations taking place in one issue. It's a vast canvas that they work with and every big moment, every conflict, of this large-scale battle is conveyed in epic fashion. 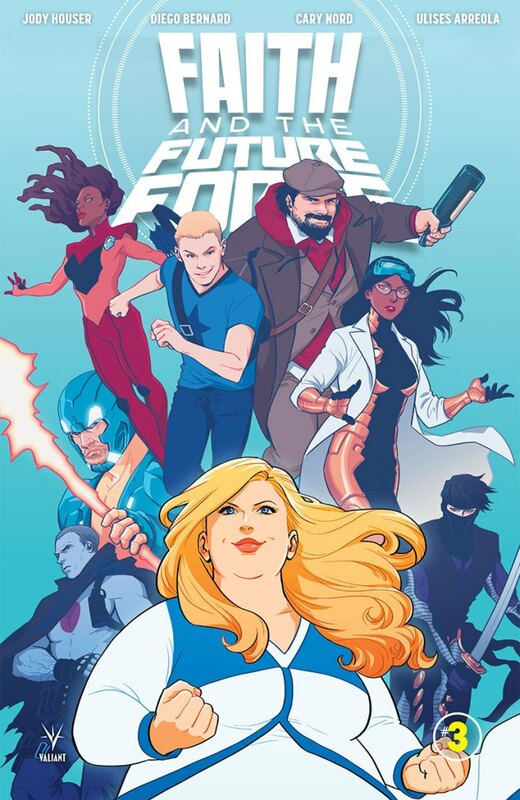 'Faith and the Future Force' comes to a crossroads. The old plan just doesn't work so will Faith's new one work? Fans of time travel sci-fi stories will love this immersive adventure with heroes that won't quit. We should be in for one hell of a finale.